Where there's silver, there's tarnish. While getting the tarnish off your flatware might be an occasional inconvenience, to museum curators and conservators, it's a threat to irreplaceable works of art. To protect these objects for generations to come, scientists from the A. James Clark School of Engineering at the University of Maryland, College Park, have teamed up with conservators from the Walters Art Museum in Baltimore, Md., to develop and test a new, high-tech way to protect silver art objects and artifacts, using coatings that are mere nanometers thick. The technique, called atomic layer deposition (ALD), will be used to create nanometer-thick, metal oxide films which, when applied to an artifact, are both transparent and optimized to reduce the rate of silver corrosion. The films are created when an object is exposed to two or more gases that react with its surface. "ALD gives us an exquisite level of control, literally at the atomic level," says Ray Phaneuf, a professor of materials science and engineering (MSE) working on the project. "It's an effective, low-cost strategy to reduce corrosion that preserves artifact appearance and composition while complying with the rigorous standards of art conservation practice." Eric Breitung, a scientist who runs E-squared Art Conservation Science, proposed the collaboration after conducting preliminary investigations into the use of ALD on silver at New York's Metropolitan Museum of Art. "I approached members of the Clark School faculty because of their expertise and the university's extensive ALD facilities at the Maryland NanoCenter," he says, adding that the faculty members' previous collaborations with museums made them a good match for the Walters and its silver collection. Walters Art Museum Conservation Scientist Glenn Gates explains the goals the new coating has to achieve. "First, its appearance must be acceptable for display in a museum context. It has to be tough enough to endure transport and handling, but not so tough that it can't be removed. It needs to be completely removable so an object can be re-treated to meet future standards of conservation and aesthetics. And finally, it should not cause any harm to a piece, even if it breaks down." Gates, who works with the Walters' world-class silver collection, is well acquainted with the battle against tarnish. He points out the project's figurative mascot, Antoine Louis Barye's 1865 Walking Lion sculpture, as exactly the sort of piece that could one day benefit from the new treatment. It has been cleaned and lacquered twice since 1949, but in both cases ultimately experienced deterioration problems with its coatings. It is currently unlacquered but must be kept in a special exhibition case to ward off tarnish. "The Walking Lion represents a complex shape that, being difficult to coat with traditional lacquer, might benefit from ALD protection," he says. The team will test the new technique, first on small samples of fine and sterling silver, and then on objects from Gates' own collection, such as 19th century demitasse spoons and Morgan silver dollars. 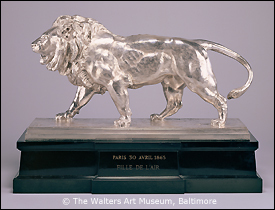 While the Walters does not expect any pieces from its collection to receive the experimental treatment during the course of the study, once it has been proven effective and safe, the Walking Lion would be a prime candidate for this procedure. The three-year project is one of the first to be funded by the National Science Foundation's Chemistry and Materials Research at the Interface between Science and Art (SCIART) grant program, which supports projects in the field of cultural heritage science through the funding of collaborations among conservation experts in museums and scientists in academia. The SCIART program will be highlighted at the 2011 national meeting of the American Chemical Society, which has invited the team to present their work. The project's other team members include the museum's Director of Conservation and Technical Research Terry Drayman-Weisser, a recognized metals expert, and, from the University of Maryland's Department of Materials Science and Engineering, Professor Gary Rubloff, Research Associate Laurent Henn-Lecordier, and Graduate Assistant Amy Marquardt, who brings to the project her previous experience working on bronze patinas with the Smithsonian's Museum Conservation Institute.